Update: Fire Corn Popcorn won the award for most innovative new savory snack at the Sweets and Snacks Expo. Occasionally we have the opportunity to be a part of a brand as it first launches. That was the case ten years or so ago when Clarisonic was still a vision and a sketch. This year we are a part of Greg “B.A.” Anders Fire Corn Popcorn. 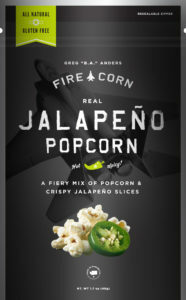 Greg served as a U.S. Air Force fighter pilot and used to enjoy popcorn made with real jalapeno slices after many of his flights. It was his goal to make this commercially and bring it to the market. He has done so in record time, which I guess is not surprising for a fighter pilot. Thanks to the team’s collaboration on the brand identity and story and the skilled work of Graphiti Associates, Greg now has a very strong brand identity, packaging and website. The product is launching at the Sweets and Snacks Expo in Chicago this week. We hope you will have a chance to taste it soon.